00:04 Joel Harford: Hi, welcome to the Two Journeys podcast. Two Journeys exists to help Christians make progress in the two journeys of the Christian life, the internal journey of sanctification and the external journey of Gospel advancement. This podcast is Episode 2 in the Bible Study Question series focusing on the book of Philippians. 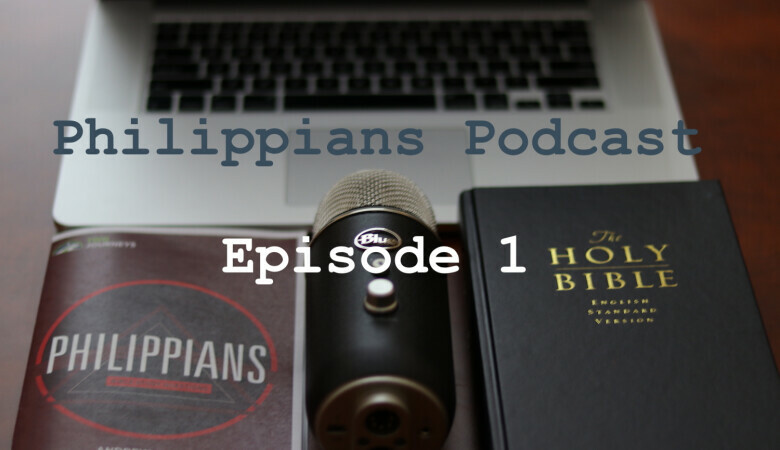 We're going to be looking at Philippians 1:12-30. Andy, what can you tell us about this section? 00:26 Pastor Andy Davis: Well, this is one of my most favorite sections of all of Paul's writings and in this section we get Paul's attitude toward life and death, the incredible statement right in the middle of this section for me, to live is Christ and to die is gain. Also from this section, I derived the idea of the two journeys, that is the focus of the ministry that we have here. The two journeys are described here. So that's just an initial comment, but this is an amazing section of scripture. 00:53 Joel: So for the sake of our audience, I'm going to read the verses 12-30, reading from the ESV. I want you to know, brothers, that what has happened to me has really served to advance the gospel, so that it has become known throughout the whole imperial guard and to all the rest that my imprisonment is for Christ. And most of the brothers, having become confident in the Lord by my imprisonment, are much more bold to speak the word without fear.Some indeed preach Christ from envy and rivalry, but others from good will. The latter do it out of love, knowing that I am put here for the defense of the gospel. The former proclaim Christ out of selfish ambition, not sincerely but thinking to afflict me in my imprisonment. What then? Only that in every way, whether in pretense or in truth, Christ is proclaimed, and in that I rejoice. Yes, and I will rejoice, for I know that through your prayers and the help of the Spirit of Jesus Christ this will turn out for my deliverance, as it is my eager expectation and hope that I will not be at all ashamed, but that with full courage now as always Christ will be honored in my body, whether by life or by death. For to me to live is Christ, and to die is gain. If I am to live in the flesh, that means fruitful labor for me. Yet which I shall choose I cannot tell. I am hard pressed between the two. My desire is to depart and be with Christ, for that is far better. But to remain in the flesh is more necessary on your account. Convinced of this, I know that I will remain and continue with you all, for your progress and joy in the faith, that in me you may have ample cause to glory in Christ Jesus, because of my coming to you again. Only let your manner of life be worthy of the gospel of Christ, so that whether I come and see you or am absent, I may hear of you that you are standing firm in one spirit, with one mind striving side by side for the faith of the gospel, and not frightened in anything by your opponents. This is a clear sign to them of their destruction, but of your salvation, and that from God. For it has been granted to you that for the sake of Christ you should not only believe in him but also suffer for his sake, engaged in the same conflict that you saw I had and now hear that I still have. 03:25 Joel: So Andy, you mentioned the two journeys of Christian life, that's the whole reason we named this ministry “Two Journeys.” What is this section, (verses 12-25), how does this show us the internal journey and the external journey? I should flip those. The external journey and then the internal journey. 03:42 Andy: Well, that's a great question, I actually would want to begin in the middle, in verse 20, where Paul says his desire is that Christ will be exalted or honored in his body, whether by life or by death. So I really am asking the question, "What is the purpose of our lives once we've come to faith in Christ, once our sins have been forgiven, we've been adopted as sons and daughters that live in God, now what? How should we live our lives? For what should we live our lives? And I think verse 20 says very plainly the reason why, we should desire that whether by life or by death, Christ would be exalted in our body. 04:16 Andy: So that's great, that Christ be glorified, magnified. But how? And I think the two journeys is Paul's answer here, although I don't think he formulated it in that way, it just comes out in what he writes. So, I would begin, let's say in Verse 25, in which he talks about his desire to continue in the body so that he can help them grow in their faith in Christ. He says in verse 25, convinced of this, "I know that I will remain and I will continue with all of you for your progress and joy in the faith." But he said the same thing, used the same Greek word, the word is "Prokope" which is progress or advance back in verse 12. He said, "I want you to know that my imprisonment is actually served to advance the Gospel." So that gave me the insight of looking at the two journeys. The idea of journey is one of making progress. You're moving from point A to point B, all the way through. Like Jesus, "I am the first and last, the alpha and omega, the beginning and the end." So they are journeys. And they're different but they're related. There's progress of the Gospel, that'd be evangelism and missions, that's verse 12. And then progress in the Gospel. That would be discipleship, or sanctification, verse 25. Those are the two journeys. 05:34 Joel: Now we also see just these incredible life-changing truths on attitude. You mentioned last week that Philippians is the attitude book, how does this section show just a marvelous attitude towards both life and death? 05:47 Andy: What an incredible statement in verse 21, "For me to live is Christ and to die is gain." I don’t think you can have a healthier attitude in life other than, "For me to live is Christ and to die is gain." Have a healthier attitude about both life and death. Paul's attitude about life is, I want Christ to be exalted in my body, for me to live is Christ, he is my life as it says in Colossians, "When Christ who is your life appears," etcetera. Or it says in Galatians 2:20, "I have been crucified with Christ and I no longer live, but Christ lives in me, and the life I now live in the body, I live by faith in the Son of God who loved me and gave himself for me." So that's it, for me, to live is Christ. 06:28 Andy: But then in verse 21, he says to die is gain. And that's almost blasphemous, it's like, For me to live is Christ and to die is something better. But what could be better than Christ? Well just more of Christ, to be able to see him face-to-face, to see him in his eternal glory, that's better by far, Paul says. So you can’t have a healthier view of both life and death than that. I want to live maximally as long as the Lord wants me to live, I want to live for His glory. But when I die, I'll be happy to go and see Him face-to-face. 07:03 Joel: That's a perfect intro to my next question which is, how does Paul teach us to suffer well, obviously keeping your eye on the prize, on meeting Christ face-to-face, but how does he teach to suffer well in this section? 07:15 Andy: Well that is very important, he ends the chapter with that, he says, "You know, I'm going through the same struggle you saw that I had in Philippi…" When Paul and Silas were in the Philippian jail, "and now you hear that I still have," I'm still imprisoned. Different jail, but the same kind of thing. But he says, "You know, it's been granted to you, also Philippians on behalf of Christ, not only to believe in Him, but also to suffer for Him, and given Philippians, that you are going to suffer, you're going to have to learn how to suffer well, you're going to have to have my same attitude about both life and death, your life is for the exaltation of Christ in your body, so whatever happens in your life whether beatings, imprisonment, the loss or confiscation of property, or nothing, maybe even prosperity, no matter what happens, your life is Christ's to do with as he sees fit." 08:03 Andy: "Now, if you are persecuted, it's vital that you suffer well, you need to actually give your persecutors a clear evidence of the difference between them and you," as he says, very plainly that, "You're standing firm, in one Spirit contending as one man, for the cause of the Gospel without being frightened at all, in any way by those who oppose you." "This is a sign to them that they'll be destroyed and that you'll be saved, and that by God. And so the idea is that God's actually putting you on a pedestal in that you're so joyful in your suffering. They don't have anything like that level of confidence and so that ends up being very convicting for them and hopefully will convert some of them like the Philippian jailer. 08:46 Joel: I want to read verses 12-14 again before I ask the next question, he says, "I want you to know brothers that what has happened to me has really served to advance the Gospel so that it has become known throughout the whole imperial guard and all the rest that my imprisonment is for Christ." Now, here's verse 14, "And most of the brothers, having become confident in the Lord by my imprisonment, are much more bold to speak the word without fear." This is counter-intuitive, he is imprisoned and therefore, they're emboldened. How does this section encourage then us 2000 years later, to also be courageous in evangelism now? 09:23 Andy: Well, I think it all started with Paul. Paul was flourishing spiritually, in prison. Not flourishing physically. He was being beaten, he has being imprisoned, he was being deprived of freedom and of good food and drink, and he was suffering, but he was doing so well, and he was leading others to Christ and he was filled with joy, like Paul and Silas when they were singing in midnight, and other prisoners were listening to them. So there's a sense in which the Christians could see, they were ready to see with spiritual eye sight what was going on in Paul's life and they wanted that. And so they're like, "Well look, what's happening to Paul, I'm not afraid, I'm not afraid of being imprisoned, I'm not even afraid of dying. Paul's not." And so, they followed his leadership, so he set a good example. And so as a result, they had lost their fear of evangelism. So they are out there even more boldly, preaching the Gospel. 10:12 Andy: Now I heard a story a number of years ago from Voice of the Martyrs, who was about some of our Vietnamese brothers and sisters in Christ and the communist government there. This is long after the war had ended, but the government was anti-Christian, cracking down on Christians, and they were arresting and beating and even killing, torturing and killing, some of their leaders. And what ended up happening is the rest of the church got bolder and bolder in the Gospel, because of it, they lost their fear. Now, there's a kind of a psychological level of that. It's like, "I've seen what you can do and I'm not afraid of it. And the more that they persecute us, the less were even afraid of it, brcause we've seen the worst they can do and we're not afraid." But I think also the Holy Spirit of God is at work, He's empowering them, as they don't shrink back He actually gives them extra doses of power. 10:58 Joel: Man, that's incredible. Now, what about this imperial guard, he says, "It's become known throughout the imperial guard". 11:05 Andy: Well, it seems that he's talking about Roman soldiers, the Praetorian Guard, who were part of, at the end of the book in chapter four, Caesar's household. So they're some of the best soldiers there were in the Roman army. They were selected out for their bravery and their strength and courage and skill to protect Caesar, like his body guards. And so it was a whole arrangement and organization of the Roman army, and they were entrusted to guard Paul. But as they're chained to Paul or they're there in the prison cell with him, he's not going to be silent. He was talking to them about the Gospel and was winning some of them over. 11:40 Andy: And so we don't know the full history, but we see that the Gospel had spread to the extent of the Roman Empire within the first century and you can imagine that men this courageous, this bold who were serving ultimately, King Jesus and not Caesar would take the Gospel even to the wilds of Britannia or Germania or other places and were sharing the Gospel. So God used that. But if you can rewind the tape all the way back to a prison cell, where Paul was sitting with the Praetorian guard, and some of them, not all of them, but some of them were coming to faith in Christ. So some of the Praetorian guard had heard that he was in chains for Christ and they heard the Gospel from him. 12:16 Joel: Yeah, I think, verses like this and also at the end of the chapter where he gives the greetings. Then he says, "Those who are of Caesar's household greet you." And it just shows us just how the Holy Spirit just sent the Gospel of Christ all the way throughout the Roman Empire, very early. 12:33 Joel: And it was effective. 12:34 Andy: Yeah, it spread rapidly. The empire went first. Chronologically, the Romans spread just for their own worldly pride, and glory, and money, and power and all that. But then God used the roads that they built and He used the ecosystem and the common language and the Pax Romana, the Roman peace, the system of justice to spread the Gospel. Now, the Roman emperors were among the greatest early persecutors. But there were also many Romans that came to faith in Christ. So it seems like in the New Testament, you never meet a Centurion that isn't favorably disposed to Christ or the apostles or the Gospel. And so God used these soldiers, many of them, to come to faith in Christ. So it's really very encouraging. So yeah, at the end of, in Chapter Four, we're going to meet some from Caesar's household that had come to faith in Christ. 13:21 Joel: Yeah. Praise the Lord. 13:23 Joel: Now what about verses 15-17? He brings up kind of a strange topic. He says, "Some preach Christ from envy and rivalry, but others of good will." What is going on with... Some trying to... This seems strange to us. "Preach Christ from envy and rivalry"? What do you think's going on here? 13:42 Andy: It's hard to tell. It could be unconverted Jews that were acting like Christians to get Paul in trouble. Or it could be people who are false brothers; people who are claiming to be Christians, but really weren't. Maybe, could be the Judaizers that he's going to mention in Chapter 3. But at any rate, he doesn't think highly of them personally. He thinks their motives are terrible. But the difference between this situation here in Philippians and the situation in Galatians, the Galatians were preaching that... They were preaching a false gospel and he's going to warn about it even in this Epistle in Chapter 3. These folks apparently are preaching the true gospel. They're preaching Christ, Christ crucified and resurrected, but they're doing it from false motives to get him in trouble and stir up trouble for him. And he doesn't seem to care about it. He cares about them. I think he would wish that they would preach Christ out of a good motive and out of brotherly love. So for them it's a bad thing. But for the spread of the Gospel, it's a good thing because they are actually preaching the true Gospel. 14:42 Andy: I will say this. There's another side on this and it has to do with people who are later exposed as false teachers. They're exposed in some ways as, maybe not false teachers, but they are on TV and they're in it for the money, and they're in sin and all that, but they are preaching the true Gospel. Can God use someone like that to do active work and win people to Christ? Yes. If that individual is preaching the true Gospel, God can use it. But in the end, it's much better that people preach the true Gospel from a true heart or a true desire for the glory of God. 15:15 Joel: Now, What does Paul teach us about prayer in verse 19? 15:20 Andy: Well, he is asking them to pray for his release from prison. I think you could have that sense because he's in prison and he's going back and forth, whether he's going to live or die. And he's going to ask for them, for their prayer, but he especially desires that they pray that Christ will be exalted in his body, whether by life or by death. So it comes down to a translation, I think in verse 19, he says, he wants them to pray so that through their prayers and the help given by the Spirit of Jesus Christ, his imprisonment, what has happened to him, will actually turn out for his deliverance, would be one translation, or salvation might be another. And I would tend toward salvation here; that Paul considers himself a work in progress. 16:10 Andy: He urges Timothy in 1 Timothy 4 to work on his spiritual gift of public reading and teaching and preaching so that he'll save both himself and his hearers. So if we're not in glory yet, we're not finished with our salvation, if we're still being sanctified. So he wants the ongoing work of salvation to happen in his life through their prayers. So what do we learn about prayer? God uses the prayers of the saints in the lives of other saints. So we should solicit prayers from our brothers and sisters, especially if we're going through trials. Pray that this trial might actually strengthen my faith, like Jesus prayed for Simon Peter; that his faith would not fail. We should ask people. "I'm going through a medical emergency or my family is. We're going through a big trial. Pray that my faith would flourish during this time that I would get stronger in the faith, not weaker"
17:00 Joel: Yeah, 'cause he says, "Through your prayers and the help of the Spirit of Jesus Christ." So Christ is using the prayers of the saints and it is working. 17:08 Andy: It is one of the great mysteries for me. I believe in a meticulous doctrine of providence. The our hairs, the hairs of our head are all numbered. Sparrows don't fall to the ground apart from the will of God. And along with that, we are taught a robust doctrine of prayer, that God answers prayer. And the big mystery for me is not, Does prayer change me when I pray for others? I do grow in my love for them and my understanding of God's will. But, does prayer change things? Or a better way to put it, is prayer powerful and effective? James says it is. So we believe that when we get down on our knees and pray for an imprisoned pastor, in a closed country, to be set free, that God will use our prayers to deliver that individual back to his people and back to his family. He actually, through the Spirit of God, sovereignly working in people's hearts and through our prayers, He affects things. 17:58 Joel: So let's talk about verse 20 and verse 21. These verses just destroy the Prosperity Gospel, the false Gospel of health, wealth, and prosperity, and the idea that you set your mind on material things that you like and then seek them. And these verses, they destroy it. And not because Paul doesn't want to get out of prison, but because his whole motivation is actually just exalt in Christ, but he says, "Whether by life or by death." Imagine preaching that in a Prosperity Gospel church. But what do you glean out of these verses, as far as just the attitude of putting ourselves at God's disposal to do whatever He wants? 18:38 Andy: It is really one of the most remarkable assertions ever made by a human being. This is the strongest example of Christ-like self-sacrificial thinking you could ever have. Look at what we're talking about. Paul, if I could give you a choice right now to take you out of this world, this world of suffering and pain, and bring you into glory where you'll never experience death, mourning, crying, or pain again, or you would continue in the body, imprisoned, probably tortured, persecuted for years to come. But the result would be that your brothers and sisters would be strengthened in their Christian faith and that other lost people would be won to faith, what would you choose? 19:21 Andy: Now, he does say, he's torn between the two; for himself, he'd rather be with Christ. And we should say that because that's our reward, that's where we're heading. But for himself, he is convinced that he will remain and he would actually prefer to remain. Now, this is the most Christ-like attitude. We're going to see it in chapter 2, where Jesus left behind all the glory and the pleasures and comforts of heaven, and was incarnate and lived a life of servanthood, even to the point of dying on a cross. Paul has imitated his Savior in this self-denying, self-sacrificing attitude. And it's a challenge to me, I don't think I'm there. 20:00 Joel: Yeah, how do we do this? I mean obviously Paul is, he is an example, "Follow me as I follow Christ." And he also had the intimacy with Christ being in the Philippian jail, he had this incredible spiritual experiences. I think we can almost understand how he would then adopt that mind once he realizes, "I've learned to be content in any situation." But how do we do that? I feel like almost I'm handicapped in my Christian walk because I haven't had the trials he's had but I want this attitude. 20:29 Andy: Well, I think that's just a beautiful thing already. I feel the same thing. I think we go back to the Beatitudes where it says, "Blessed are those who hunger and thirst for righteousness." So I think it all starts there, that we begin with the desire, we say, "I yearn to have the same kind of self-denying, self-sacrificing attitude that Jesus had in leaving heaven and humbling himself, even to the point of death on the cross." We're told to have this mind, the same as Christ, so that is ours in Christ. So to say, "That's my birthright, to actually think like Jesus in this." But to then be honest and say, "But that's not how I live my life." The flesh, I've noted this from infancy… And you have little kids and I've had them too, and you watch when they come home from the hospital, fanatically committed to their self-interest. Fanatically committed to, as he's going to say in chapter 2, "Look out for their own interest, not the interest of others." 21:22 Andy: So, when you think about how an infant's crying in the middle of the night, he's not thinking whether his mother needs a little more sleep or whatever, all he or she wants is what they want, diaper change, want a feeding, want to be hugged, something. And we are trained, good parenting is to train them out of that selfishness, so also a sanctification. So for us to be honest to say, "I am fanatically committed to my self-interest, but I don't want to be," that's the flesh. "O Lord, would you, by the power of the Spirit, little by little work a Christ-like self-denying, attitude in me? So I can say for me to live is Christ and to die is gain, and I want to go on serving in the body, and will mean fruitful labor for me, that's what I want." To just set that before us as a desire and then pray and then live until it starts to happen. 22:10 Joel: Paul says it's more necessary that he stay? Why was it more necessary? And again, how does that help just your average Christian think about life in the body and what we have left to do with this life? 22:24 Andy: Well, I think we would look at it like a father and young children. I think you could imagine with your kids, with mine, it's more necessary for them that you continue as their dad until they're adults and that's because of the incredibly powerful role of a loving godly father in the training of little kids, of sons and daughters. And for me, I think Paul talks in another place in Corinthians, I think, "I've become your father in the gospel." And so he's got that fatherly love to the Philippian church and he says, "It's more necessary for your growth in Christ, for your full maturity that I keep on teaching and setting an example, and writing Epistles like this one and preaching to you, if I have the chance. So you're going to be benefited by my spiritual gifts and by my ministry. So it's more necessary for you that I continue on." 23:23 Andy: Now the fact of the matter is, there's always going to be more work to do until the Lord returns. At some point He's going to call us home. So we should go with a certain kind of sweet regret saying, "I know there's more work I could have done, but I'm going to have to just give that to the next ones and trust that they will carry on the work." But for Paul, for himself, he said, "I want to keep on going. It's more necessary for you, for your full maturity in Christ that I keep on doing what I'm doing here." 23:47 Joel: So he says he's going to stay, he says he's convinced of that. But he's going to stay for their progress and joy in the faith. Now you mentioned that in the beginning, this internal journey of sanctification, so progress and joy. Why is sanctification so important in the Christian life? And I think this gets overlooked in evangelicalism today, is the role of the increasing growing in Christ-likeness. Why this is so important? 24:15 Andy: Well, this is part of the stages of salvation that the Lord in his wisdom has given to us. He didn't have to do it this way, but he chose to do it this way. And that is, that we receive our salvation in stages, it begins with justification by faith alone apart from works or the law, we hear and believe the gospel, and receive full forgiveness of all of our sins, past, present, and future. We also receive the gift of adoption into the family of God, we receive the gift of the indwelling Holy Spirit and spiritual gifts and other things that fit us for useful service. But then we're given commands to start changing our habit patterns which have been sinful up to that point, to make them more and more like Christ. We're to think, habitually think like Christ and habitually live like Christ. And that takes a long time. 25:00 Andy: I believe part of it is to humble us because that long journey is a very humbling journey. We all know, any mature Christians, you know how hard it is to be perfect in Christ everyday to have only godly thoughts and only godly actions, and to not omit anything that you should do and not commit anything you shouldn't do, that's hard. And so, we're given many verses in the New Testament on progress in Christian maturity. This is one of the lighter mentions of it. I just noted the word prokope or progress. But Romans 6, 7, and 8, those are three chapters on sanctification. 2 Peter 3:18 says that we should “grow in the grace and knowledge of Christ.” So this is just a statement of progress in the faith. Now, let me explain what I think the faith is here. The faith is the Christian faith or the body of doctrines known as Christianity, making progress in the gospel, not the progress of the gospel, which we saw early in verse 12, which is the spread of the gospel through evangelism and missions to people who are not yet Christians. This is the progress of people who are already born again in the gospel so they'd become more and more like Christ. 26:02 Joel: Now, he says, "Let your manner of life be worthy of the gospel of Christ," and this is a weighty charge here. "Let your manner of life be worthy of the gospel of Christ." How do we do this? And obviously, it's connected to sanctification, but how does a Christian know that, yes, I'm living a life worthy of the gospel? 26:21 Andy: Well, this is the way the New Testament teaches holiness or sanctification, it tells us what we are already by the declaration of God and then it tells us to act like it and live like it. We are sons and daughters of the living God, let's act like it, let's live like it. We are heirs of heaven, let's act like it. We are called holy, we are saints, then let's be holy. Let's be what we are, we are called light in the Lord, let's live like light. And this is again and again, the pattern in the New Testament. So here, we're told that the conduct of our way of lives, our manner of life, practical day-to-day living should be worthy of the gospel. In other words, it should be informed by the gospel, it should be holy, it should be conformed to Christ. So the gospel is the good news that God has not counted our sins against us, but in Christ, has forgiven us our sins and is conforming us little by little to the pattern of Christ until we will be glorious in heaven, that's the gospel. So we are to live everyday life in conformity with that glorious gospel. 27:30 Joel: Now, he mentions this unity at the end of verse 27, that he wants to hear that they're standing firm in one spirit, with one mind and striving side by side for the faith. I'll deal with that in a minute, but what about this one spirit and one mind? I know we're not robot clones all thinking the exact same thoughts, but how do we really adopt this to display beautiful Christian unity? 27:56 Andy: Yeah, well, in chapter 2, verse 2, he says, "Make my joy complete by being of one mind, having the same love, being one in spirit and purpose," one of the translations gives us. And so that's, I think, one of the best statements of the unity of the Trinity, and I think we're going to talk about that, God willing, maybe next time. But the idea is that we are supposed to be as one as the Father and the Son are one, and the Father and the Son never disagree about anything ever, on literally trillions of decisions about how to set up biological interlocking spheres in the world, or how to make the stars, or what to do with redemptive history. Big and little things, they have never ever disagreed about anything. We disagree about many things, again and again we disagree, and that's just evidence of our sinfulness, we think wrongly. And so the idea is, the more we are conformed to the mind of Christ, the more we're going to agree with each other. 28:54 Andy: And so Paul again and again (not just here in Philippians but also in 1 Corinthians) commands us to be of one mind. He says at the end of this book in chapter 4, "I plead with Euodia and I plead with Syntyche to be of one mind, to agree with each other." So I think that a Christian husband and wife should seek to agree about everything. Elders in a church should seek to agree about everything, and they should talk and pray and study Scripture until they agree, that should be a goal. Now, that could be time consuming but the idea here is that he wants the Philippian church to be of one mind, and he's going to talk much more about that in the next chapter. 29:30 Joel: I know you've taught in your teaching before, I've heard you say that the most powerful and effective weapon for the advance of the gospel is a healthy local church. And so when I think of that, I think of a church, a healthy church that's united in these journeys, the internal journey of holiness (you're a chosen race, a royal priesthood, a holy nation, as Peter says), but then united also in the advance of the gospel. And so, how this really crucial to a local church? Because that's what this group is. How is this unity crucial to fulfilling its mission? 30:04 Andy: Yeah, I think the idea is that there's a flourishing community of relationships, of families that come together, husbands and wives and their kids with other husbands and wives and their kids, or singles. And they come together in a family of faith, they're brothers and sisters in Christ and they really love each other, they make sacrifices. Early on in the Book of Acts, people were all willing to make amazing financial sacrifices selling old properties and putting the money at the apostles' feet, and it was distributed to anyone as he or she had need. And so, when the outside world that's so selfish and swindles each other, and even commits crimes against each other sees that, Jesus said that, "By this will all people know that you're my disciples, if you love one another." So you put that kind of sacrificial genuine heart affection for each other on display. That is a powerful argument for the truth of the gospel. 30:52 Andy: Especially if some of those people were in groups that were hostile towards one another, that there are racial tensions and people group tensions between each other that are long-standing. But individuals from those two groups have become genuinely brothers and sisters in Christ and love one another. That's very surprising to the surrounding community as they watch. They say, "I want to know what it is you have." So the idea is that a united church that's living out that kind of sacrificial love for one another is a powerful argument for the truth of the gospel. And He says in John 17, "Father," Jesus praying to his Father for the church, for those that will believe in the gospel through the message of the apostles, so this is across 20 centuries. He prays for their unity, "Father, may they be brought to complete unity to let the world know that you sent me and that you will love them even as you have loved me." So the idea is the truth of the gospel is tied to their unity and their love for one another, so that's a powerful argument. The problem is, all over the world, churches bicker with one another and are divided just like here in this Philippian church, Euodia and Syntyche, they don't agree with one another. And we need to conquer that by the power of the Spirit. 32:04 Joel: Now, what does it mean, he says, "striving side-by-side for the faith of the gospel"? What does it mean to strive for the faith, or strive for the faith of the gospel? 32:13 Andy: Well, I'm going to say that that means evangelism, the spreading of the gospel, and I think it also might mean for the protection of the Orthodox message from false teachings. So they're going to fight to keep it pure and they're going to strive to advance it. And it is striving. Evangelism is hard. The people that hear and decide not to believe, they're going to start to persecute or resist. And so there's a labor in evangelism. You see this in Revelation 2 where the Lord Jesus talks about the church at Ephesus and some of the other churches too, he says, "I know your labor and your toil in the Lord." They labored and toiled to spread the gospel. And so there's a commitment to go evangelize. They would run ministries maybe for the poor and needy, that takes sacrificial efforts, time, energy, money to reach out to the poor and needy. So there's a labor, there's a striving for the cause of the gospel. So I would call it evangelism and a protection of the Orthodox doctrine of protecting that message from false teaching. 33:14 Joel: Now, in verse 29, it's very interesting. He says, "For it has been granted to you for the sake of Christ, they should not only believe in him, but also suffer for his sake." And so, to see that word granted and suffer in the same sentence… It's almost like, I gave you a gift and you're going to suffer. But how does the gospel really transform suffering? And how is it actually a gift from God to be able to suffer for the name of Christ? 33:39 Andy: Well, I'm going to circle back now to the comment you made earlier about the health and wealth of the prosperity teaching. This is a killer for that. I mean, granted to suffer. They (these prosperity teachers, those that are preaching about money and prosperity) would look on it, that suffering and deprivation is never a gift, that's from the devil. But we know otherwise. We know that if somebody is genuinely born again, and they are put through the fires of affliction. It could be a medical issue, it could be persecution in a closed country, financial deprivation. These fires of affliction can purify our souls, they can make us less worldly, they can make us cling more closely to Christ, pray more fervently for help and draw us together as the persecuted community has to draw together and rely on each other. 34:29 Andy: So it's a gift, conversely, sometimes God grants to unbelievers that they can have their heart's desire so they can be as prosperous as ever they would want to be. As it says in the Book of Romans 11, "May their table be a snare and a trap, a stumbling block and a retribution to them." The table could represent financial prosperity, like "you prepare a table before me in the presence of my enemies," that's in Psalm 23. The idea of prosperity can be a snare and a trap, a stumbling block. And so, in effect, God could just give people over to the desires of their hearts and they become very prosperous, but not godly at all, and all it does is harden their hearts, makes them more and more worldly and in the end, they are condemned. But for his own children, he'll never give them over to that, He will discipline them and train them through pain and suffering. 35:21 Joel: Well, thank you, Andy for answering these questions. Do you have any final thoughts on this passage or just chapter 1 as a whole? 35:26 Andy: Well, I just would commend the memorization of Philippians. It's not a long book, it's 104 verses. And the thoughts that I've had on this book have evolved and developed, and been sharpened by just repetition that comes through memorization. So I'll commend that discipline. I know it's not easy. But with it being only 104 verses, at a verse a day, you could be done with it in about five months or something like that, maybe even less and be able to recite it, and it would be a great benefit. Beyond this, I just think Philippians 1 is one of the great chapters in the Bible for giving us the answer to the question, "How should I live the rest of my life? For what? Why am I still here on earth?" And it is verse 20, that Christ will be exalted in our bodies whether by life or by death. Okay, how? By making progress in two journeys, the internal journey of holiness and the external journey of gospel advance. I think this is a timeless chapter to point the way for the rest of our lives. 36:21 Joel: Amen. Well, this is the Two Journeys podcast. We are doing Bible study questions through the Book of Philippians, this was chapter 1:12-30. Please join us for Episode 3, we'll talk about chapter 2:1-11, imitating the humble mind of Christ. Thank you for listening and God bless you all. Thank you for listening to this resource from twojourneys.org. Feel free to use and share this content to spread the knowledge of God and build his kingdom. Only we ask that you do so for non-commercial purposes and in accordance with the copyright policy found at twojourneys.org. Two Journeys exists to help Christians make progress in the two journeys of the Christian life: The internal journey of sanctification and the external journey of gospel advancement. We do this by exporting Biblical teaching for the good of Christ's church and for the glory of God.